In accordance with state law, any individual who installs and services fixed or portable equipment in public or private systems in the State of Texas for the analysis and treatment of potable water to alter or purify the water or to add or remove a mineral, chemical, or bacterial content must be a Licensed Water Treatment Specialist (WTS). TCEQ is responsibile for issuing new licenses, renewing licenses, training approval and exam development. 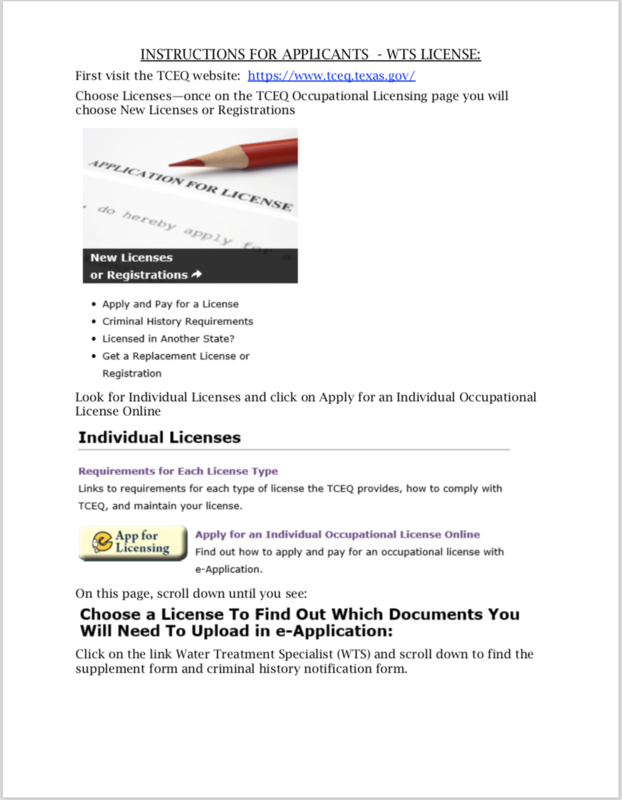 For WTS licensing information, an explanation of the application process, and training requirements, please see the TCEQ Water Treatment Specialist Licensing page. For those needing new licenses, you need to take the TCEQ exam for the highest license for which you qualify. To see a list of WTS License requirements, please refer to the TCEQ Regulations page. Refer to the WTS License Application Instructions paper (on the right) when you are ready to begin the licensing process. All Water Treatment Specialist licenses issued after December 17, 2001 require licensees to complete a minimum of 12 hours of continuing education credit before the license expires to remain current. These hours can be obtained by attending the pre-approved technical sessions at our annual convention, pre-approved WQA technical sessions, by retaking the Basic Water Conditioning and/or Advanced Water Conditioning courses, or any other TCEQ pre-approved courses. You may check your license information using TCEQ's Search Licensing or Registration Information page. TWQA's current training schedule can be found on the TWQA Course Schedule page. You must have your recertification credits (continuing education credits) in place prior to the expiration date of your license in order to renew without examination. The TCEQ will try to notify you 60 days prior to the expiration date of your Certification/License. However, it is YOUR responsibility to maintain your license. Individuals who allow their licenses to lapse must re-take the relevant TCEQ exam.